Mudstone cliff face on Irelands southern coast. My wild guess is its some sort of iron ore or oxide staining between the tiny fissures where water has run in the past, any help much appreciated. Thanks David I will stick with the iron oxide then. Thanks Jansos very interesting site. I'll add it to the tags. Shale is a type of mudstone which is characterised by having fine laminations (planar structures related to the original depositonal process) and splits into planar pieces along the laminations (fissility) A quick glance at the link shows the author is unqualified and is incorrect in the definition of fissility so great caution is advised there. There are other inaccuracies evident at a very quick glance and I would certainly not reference that as an authoritative source. 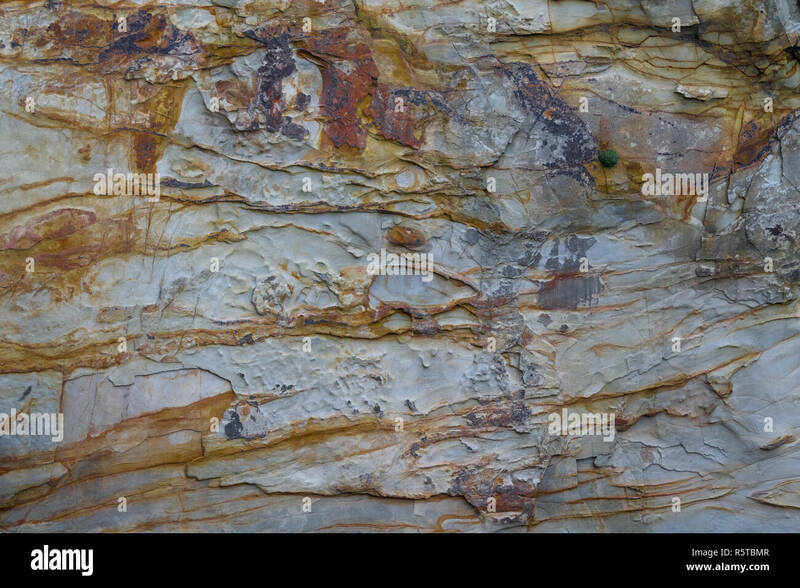 The rock definitely looks like a shale as it is seems to display laminations but field examination would be necessary as it could be a tectonic cleavage formed by compression of the rock due to tectonic rather than depositional processes and would then be a slate rather than a shale. It is impossible to tell from a picture of this scale which as it would be necessary to examine the larger scale field relations - is there large scale folding, deformation etc. Similar to the thread about homeless people, one should not make statements unless one is sure of what one is looking at. The staining is definitely caused by oxidation of iron in the sediment and is very common. There could be other elements in there as well such as manganese. The whole cliff face is pretty much as per the imager. Never ceases to amaze me the help and expertise offered on here, thanks for all the contributions. Seeing the overall context is vital here and it is also essential to know what exactly one is looking at - is this picture horizontal, vertical, at an angle etc. It also needs a scale or at least some description of the scale of the image to be of any real use to anyone for illustration. The GSI (Geological Survey of Ireland) publish detailed maps now of the bedrock geology of Ireland but it takes at least basic geological knowledge to interpret the maps. You could certainly get an idea of what you are looking at by referencing the precise locality against the geological maps and descriptions. However, I would guess images like this would have a very low saleability potential, moreover without an an authoritative and accurate description of the feature. I expect text books would be the only likely market for geological pictures as researchers invariably do their own photography and text books do need accurate descriptions. This is not to put you off as geology is a fascinating subject and the south coast of Ireland has some great geology but I would not take out a loan against likely earnings from stock pictures. To be honest my interest in geology is pretty limited, I was walking past the cliff and the image for its own sake interested me. If it sells that's fine, if not it only cost me time. PS I have just updated the location. Thanks for that next time I find an interesting rock i'll be after your advice, I have looked with a novice eye at the geological maps for around me, just out of interest as the bare rock can change hugely within 40 metres of each location, and the strata lines can go from horizontal to vertical with folds as well all again within 50 metres. Must have been a lot of movement back in the day. The whole south coast of Ireland has some fascinating geology from the so-called Copper Coast in Waterford right across into Beara. But do limit your expectations of what is possible to say without actually seeing the rock in the field or even better under a microscope . Geology is very different from biology in terms of identification of rocks. I would rarely attempt to identify a mineral or a rock from a photo without additional data which is often available online for a lot of Irish and British geology nowadays if the exact locality is known. Professional geologists use lab data (microscope, eletron microprobe, detailed chemical analysis) in addition to field relations in understanding what has happened. This is in fact the crux of the matter - how did a particular rock or sequence form. As a photographic analogy, imagine looking at a very old photo and trying to understand not only what is in the picture but what camera it was taken with, what film was used, how and where the film was developed, how it was printed and so on. And as I said, the saleability is probably very, very low. The number of pure geological pictures I have ever sold as stock is very small and I have some very good ones.